Funny how sometimes it can take the lowest point of a journey to remind yourself exactly why you decided to embark upon it in the first place. Munster 64 Ulster 7. Limerick's 'Killing Fields' relocated for an hour or so of ritual humiliation; a now familiarly spineless effort from our northern neighbours; a portent, it seems, of another utterly underwhelming campaign. Billy Burns sat in a corner of the Thomond Park dressing-room; he could have been easily forgiven for asking himself why he was there at all. But ask him is he happy now, just a couple of months later, and the only moment of obvious truth he can readily identify resides amidst the shards of that September shellacking. "I am happy with how everything has gone," says the Irish-qualified summer signing from Gloucester, whose emergence as a key performer for the province was finally franked by a man-of-the-match display as his side catapulted themselves into the reckoning for a first knock-out clash in Europe for four years after despatching Scarlets with a second bonus-point win. "Do you know what? You even ask me after Munster and the way we got beat like we did? I feel like I'm in a place where the coaches around me are great, they're really challenging me and I feel like I'm learning. "That's what I want to do. I know that I'm a long, long way away from the player I know I can be and I know that I need to be. But the main thing for me here is I am being challenged. "There are great players around me, a great balance of older heads and young guys coming through. This is why I came here, to play in big games like this." Much like his side, and allied with persistent issues up front, Burns had endured a fitful beginning to his career in Ireland but as their scrum has improved, so has the pivot's confidence; last Friday in Belfast arguably represented the perfect marriage of a rumbling pack and the decisive influence at 10 Ulster have been questing since off-loading Paddy Jackson. "By far it was the most satisfying game of my time here so far," he enthuses. "I've worked hard on the balance of my game and I've been guilty of probably over-playing things at times. "But on Friday myself and John (Cooney, scrum-half) really played the territory well. And that was all off the back of some great work from our forwards. "The last two or three weeks, they have been sensational for us, putting us on the front foot and making things so much easier. "So we're a happy bunch down there. But we also know we still have so much more to give which is exciting. "You get a lot of credit when you put those kicks in but it's all off the back of building pressure. And, if you have front-foot ball from your forwards and quick ball from the breakdown, it makes those sort of decisions a whole lot easier." His adaptability to changing match circumstances reflects his intelligence as well as was elevated quickly out of the Irish Under-18s to the 21s last summer and now into the senior pane his ability. "You saw early on I get charged down when I got a little bit lucky," he says, referencing a brief ambush by Gareth Davies amidst the squally showers. "So then it was about taking just a little extra depth, noticing that space and then having the width in the attack. "Those wingers who are calling it in. I'm just a cog in the wheel. They're calling the shots so it's up to me to put the kicks in. "I've been guilty of doing it well one week but not the next week. So hopefully this could be the start of getting some consistency." Creating chances is one thing; knowing they can be gobbled up adds extra comfort to the provider. "It's awesome. That was great fun out there to be honest. When you have finishers like Jacob Stockdale, Henry Speight and Will Addison on the end of them, they're lethal finishers. "I keep saying it, but when you have a pack that is as dominant as ours has been for the last few weeks, it's an armchair ride and you get made to look a lot better than you actually are. "We just executed the plan today and it's a credit to the way we trained and the coaches prepared us. "But we have to keep our feet on the ground and push on from this." Prompted to talk about Ireland, he demurs, acknowledging that when he arrived in the summer, those claims were more touted by others, rather than himself. "Do you know what? It was probably made into a big thing, I want to come over and play for Ireland. Of course I do. But for me, it's just about playing well here. "I feel like I'm starting to perform the way I think I can. 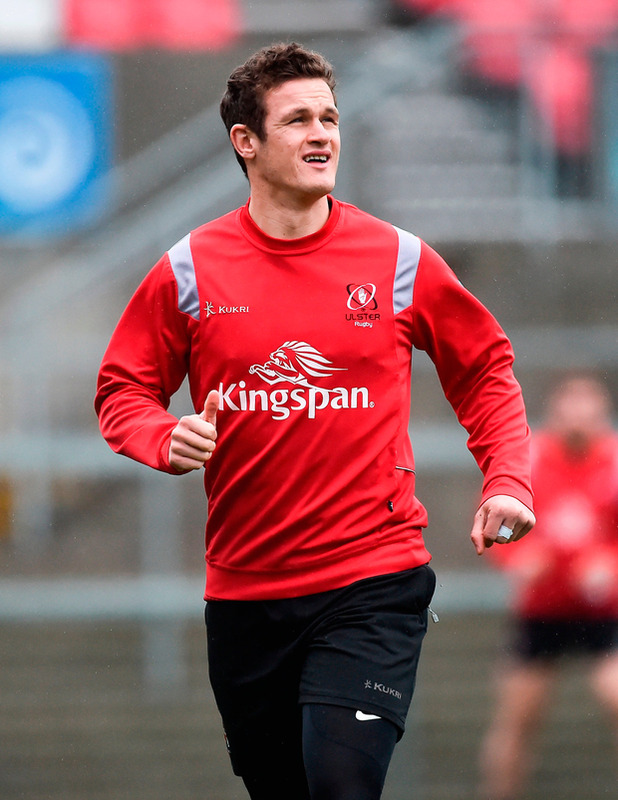 "But I'm still a way off where I need to be to be playing consistently well for Ulster, never mind Ireland."